OSCODA, MI — The Oscoda Owls hosted the Whittemore-Prescott Cardinals for a North Star League-Big Dipper matchup. The Owls (8-0) looked to remain undefeated against the Cardinals (6-1) as well as help senior Katelyn Etherton reach the 1,000 point milestone. She entered the game 25 points away. Slow start for Etherton. She scored four points in the first quarter, but her teammates pitched in giving Oscoda the 14-3 lead. The senior averaged five points per quarter this game leading into the fourth, still needing 11 points. Jitters finally gone, Etherton knocked down 4 of 6 free throws and 8 points to score 26 total points and reach 1,000 career points with 1:53 left to play. A historic moment for the Owls. 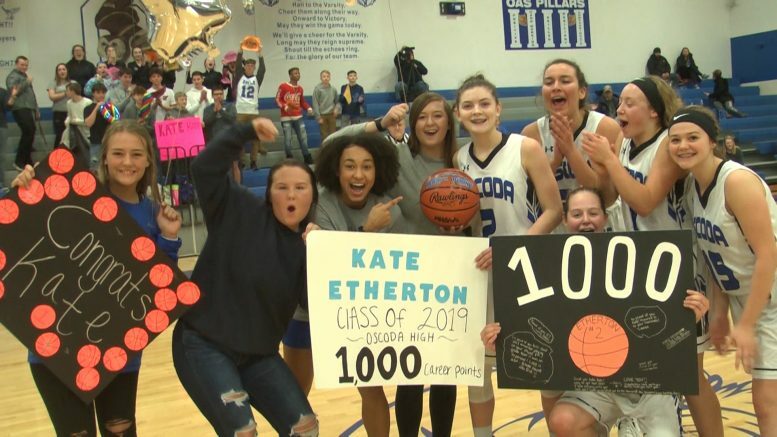 Etherton became the second girl in Oscoda history to reach the milestone. Oscoda defeated Whittemore-Prescott 60-29, improving to (9-0) overall this season and (4-0) in the conference. Cheri Meier is Oscoda’s all-time leading scorer with 1,362 points, a record set back in 1986. Meier also holds Oscoda’s single game scoring record of 44 points plus 21 rebounds, was the second leading scorer in the state in 1986, and landed a spot in the Associated Press Michigan Girls Basketball All-State First Team in 1986.